My father passed away the end of October. As I navigate this first holiday season without him -- my first as an "orphan" now that all of my immediate family, brother, mother, father, are gone -- I often feel lost, empty and overwhelmed by emotion. I try to remind myself every day how loved I was, how blessed I am, and that I am who I am because of the influence of my father and my family. The relationship between my dad and I was not always easy -- we were often polar opposites in our views of the world, politics, life -- but we found common ground in the most important place: Each other's hearts and souls. My dad drove me crazy, and I drove him nuts as well, but we respected and loved one another deeply. The older I get, the more I realize what a beautiful gift it is to live without regret. I may have disagreed with my dad, but I told him every day I loved him, and he said, "I love you, too, son." That transparency was hard-fought and hard-earned, but it's allowed me to live without regret and in a place of peace. That is the gift I will receive from him this holiday season, even though he is no longer beside me. And that is the gift from both of us that I share with you and those you love this holiday season: Peace, happiness and relationships without regret. Tell those you love this year just that: I love you. You mean the world to me. I am blessed to have you in my life. You will never regret it. I wrote the following about my father, which was read by the minister at my father's funeral. I share his gifts with you this holiday season. I am heartbroken but remembering how blessed I have been and that he is now out of pain. I have been blessed to have many larger-than-life characters in my life. Perhaps that is why I’m a writer. My father was one of the largest. 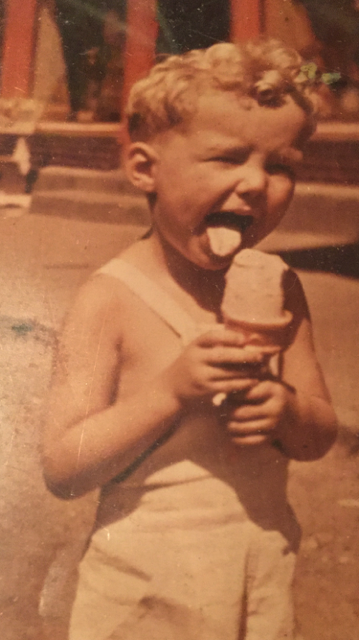 This photo of my dad as a child truly sums him up: Dimples, curls, a perpetual, "Life is sweet, let's get this party started" attitude. My dad loved life. He loved God. He loved his friends. He loved his family. He loved golf. He loved the St. Louis Cardinals. He loved the community in which he was born and raised. He was a chemical engineer, a logical man, and seemed the polar opposite of me. But he wasn't. My father was a teacher. That’s what fathers do. And what my dad taught me influenced me greatly: He taught me to respect my elders. He taught me to relish the natural beauty of the area in which I was raised. He taught the value and importance of education. He taught me how to invest and save, and the value of a dollar. But more than anything my father taught me never to quit. “You will never know what you’re capable of accomplishing if you stop,” he always told me. In my career, that has been of the utmost importance. My father was the stubbornest man I’ve ever known. People say the same thing of me. And I take it as a complement, for it is strength, toughness, resilience and a grand love of life that sets us apart, makes us strive to achieve something of importance in this short journey we’re given. I loved my father. He and my mom were great characters in life and in my life. Now, they are together again. Fred and Ethel forever united. Prepare to be dipped, mom. And have the ice cream ready.